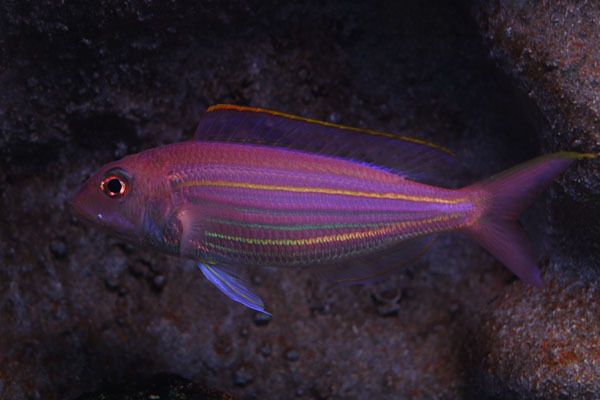 Golden Threadfin Bream (Nemipterus virgatus) | Better Know a Fish! I don’t always buy frozen fish, but when I do, I usually regret it. To be clear, fish that is caught and immediately cleaned, vacuum-packed and then frozen can be very good. Frozen mackerel fillets, for example. But the simple truth is, when a fish is frozen, there are very few clues about the freshness and quality of the fish until you thaw it. All the typical signs you would look for in freshly caught fish — clear, bright eyes, red-hued gills, a clean smell — aren’t apparent in a fish that is frozen stiff. That was the risk I took when I shopped at our local Asian supermarket recently. Asian markets are wonderful places to go fish-spotting. There is always such a variety of species — often displayed whole for the buyer to handle and examine. Some are even alive and swimming in crowded, aerated tanks. This pair of golden threadfin bream (Nemipterus virgatus) I picked up were decidedly less lively. Frozen and shrink-wrapped on a polystyrene tray, there is no way for me to know how long the fish spent decomposing in the heat before being frozen, or other guesses at its fate before being repackaged by the supermarket’s distribution center. Thawing the package out, the distinct smell of old fish hit me. Notice the general pallor of the fish. The eyes are clouded over, nearly opaque on one side. The body limp and flaccid, unlike the taut fullness of fresh fish. Scaling and gutting these two carcasses, the stink of old fish permeated my kitchen. 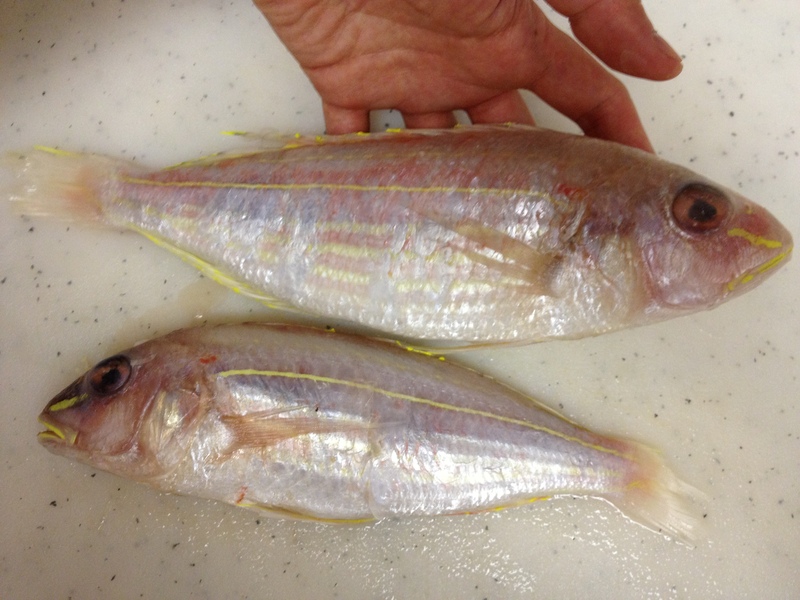 Now compare my photos of the thawed bream with these photos of fresh, never-frozen bream. Notice how bright and lively the colors are — and you can see the characteristic “golden threadfin” on the fish’s tail in the first photo. The eyes are clear and life-like. The smell undoubtedly would be that of a clean, ocean smell, with only a hint of fish odor. The golden threadfin bream is a member of the threadfin bream family, Nemipteridae, a group of fishes related to grunts and porgies. 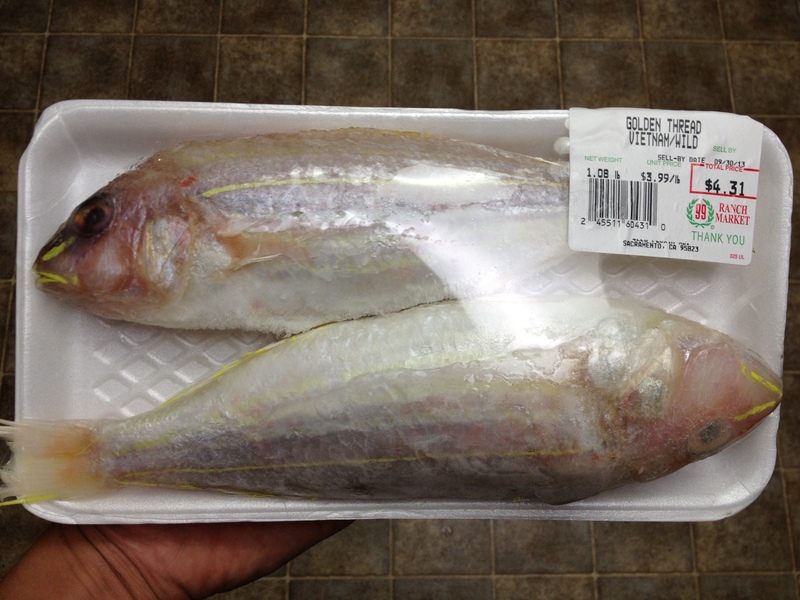 My frozen fish were caught in Vietnam, but golden threadfin bream are found in the oceans off throughout East Asia as far north as Japan, and also off of northwestern Australia. Golden threadfin bream are typically about 9 inches (23 cm) in length. And of course, they are very popular as food fish and are a commercial fishery in East Asia. 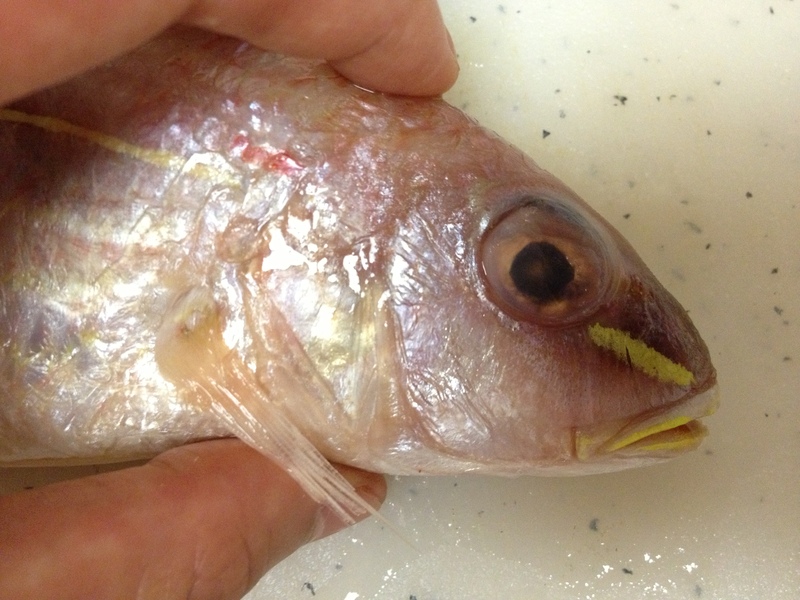 This entry was posted in Actinopterygii, Marine Fish, Perciformes and tagged foodfish, golden thread, golden threadfin bream, hung sam, itoyoridai, Nemipteridae, Nemipterus, Nemipterus virgatus, Pacific Ocean, Perciformes, threadfin breams. Bookmark the permalink. So true–I do always prefer fresh fish over frozen. I’ve had some disappointments there. Your writing is so lively and interesting, Ben. Always entertains and makes me think. I had a tuna steak tonight on the road…it was pretty good!